Alex served as his high school’s Associated Student Body vice president and was a member of the National Honor Society. He worked for Oregon Health Sciences University as a research intern and patient care volunteer. 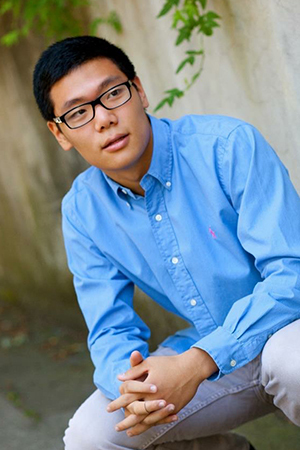 Alex moved to the United States from South Korea when he was in fifth grade and is an accomplished saxophone musician. What is the University of Oregon doing well? The University of Oregon has provided me with the academic and social environment to be a well-rounded scholar, friend, and leader in my community. I have had the necessary help and resources around me at all times to succeed in becoming the man of service and leadership I strive to be. While having the opportunity to learn in depth about the sciences and the mechanisms of the human body, I have also enjoyed the small, discussion-based classes offered through the Robert D. Clark Honors College. What are you proud of accomplishing at the UO so far? My biggest accomplishment at the University of Oregon must be the network of great relationships that I have had the chance to build so far. From professors, physicians and other health field workers, researchers, and representatives of local and national organizations, I have had the chance to share my experiences with and learn from wonderful and influential people. What are some things you’ve been doing outside of the classroom since you’ve been at UO? Outside of the classroom, I spend my time involved in medical and physiological research, through both the Department of Human Physiology at the University of Oregon and the Slocum Center for Orthopedics in Eugene. Recently, I led an Alternative Spring Break trip to Hawaii, focusing on environmental sustainability and cultural revitalization. I am truly thankful for the experience I have had to prepare, learn, and practice my passion for leadership and service. What are your plans with your major, for the rest of undergrad and for the future? With my major in Human Physiology and minors in Chemistry and Biology, I plan on pursuing a career in healthcare. I feel strongly about dedicating my career to bringing health closer to all people. For now, I plan on applying to medical school following graduation. I also have an interest in health administration and public health research. Describe your thesis and research projects. I am doing my honors thesis through the Cardiopulmonary Physiology Research Lab in the Department of Human Physiology, with Dr. Lovering as my principal investigator and primary mentor. I am studying the affect of a patent foramen ovale (PFO) on the hypoxic ventilatory response (HVR). I spent a part of the summer of 2015 collecting data and am currently performing statistical analyses. Other upcoming clinical research projects I am thrilled to be apart of include: studying the role of essential amino acid supplements in minimizing postoperative muscular degeneration in patients undergoing total knee replacement surgery and studying the dynamic stabilization of humeral shaft fractures using active plate technology.